Jerry Fesenmeyer was an 18-year-old Iowa farm boy when he and his fellow marines from the First Division engaged in a desperate firefight with Japanese soldiers on the island of Okinawa. The date was June 5, 1945. Fesenmeyer was advancing toward Shuri Castle when he spotted an enemy soldier perched in a tree. He jumped from behind a wall to surprise him, only to find himself looking down the barrel of a Nambu sniper rifle. The bullet entered Fesenmeyer’s chest between the heart and the shoulder, clipped a lung, and exited through his spine. Blood shot from his body like a geyser. “Fessy’s hit! Fessy’s hit!” someone was yelling as he blacked out. That scenario was changing, though. Doctors were developing a revolutionary, if counterintuitive, way to rehabilitate paralyzed vets: through exercise and, in particular, wheelchair basketball. The sport was born in Southern California and later helped launch the Paralympic Games, which celebrate their 56th year this September in Rio. Fesenmeyer was among the pioneers. At 90, he’s the last surviving member of the Rolling Devils, one of the first organized sports teams for disabled athletes. The Devils sold out arenas and transformed not only the public’s perception of paraplegics but paraplegics’ perceptions of themselves. The hospital that set Fesenmeyer on a new course in life was almost as unlikely as the sport that evolved there. It began as the Norconian Resort Supreme, a swanky hotel and spa spread over 700 acres of sunbaked desert with a man-made lake, an airfield, a golf course, and a clubhouse that included luxe ballrooms and ceiling paintings. 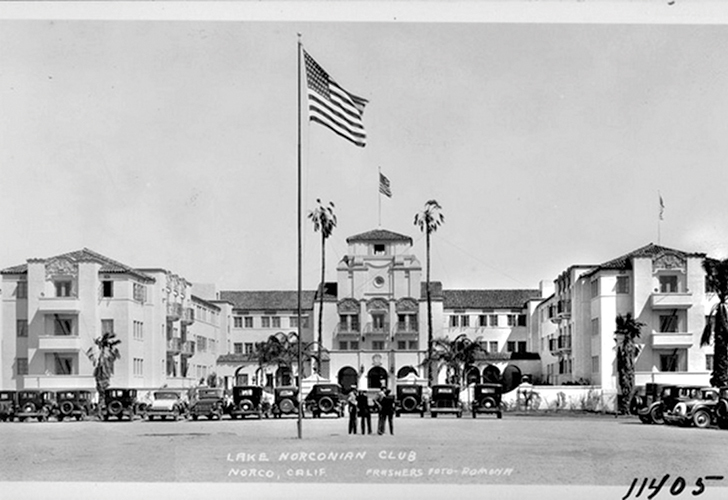 Rex Clark, whose father-in-law was media baron James Scripps, opened the property in 1929, just in time for the Great Depression to turn the Norconian into “Rex’s Folly.” In late 1941, President Franklin D. Roosevelt authorized the purchase of the Norconian for $2 million, and the navy announced plans to convert it into a hospital. As the United States became involved in the war, beds filled up fast at Norco and other Veterans Administration wards across the country. The scenario was much the same at hospitals in England. That’s where Dr. Ludwig Guttmann, a Jewish neurosurgeon who had fled Nazi Germany, was among the first medical experts to establish a spinal injury clinic to treat the whole patient—body, mind, and spirit. Exercise, or “purposeful movement,” was introduced as therapy, with sports like wheelchair polo and archery. VA hospitals adopted Guttmann’s approach, but with an American twist. Sometime in late 1946, Bob Rynearson was watching a group of disabled vets shoot hoops at Birmingham Army Hospital in Van Nuys when inspiration struck. Rynearson, who had played freshman ball at UCLA and worked in Birmingham’s athletics department, helped organize the patients of ward C into a team. To some, basketball might have seemed an incongruous fit for the wheelchair bound, what with the ten-foot baskets and all that dribbling. But modify the rules for the latter, and you have a sweat-inducing upper-body workout on a flat, smooth surface that’s easy to roll over. Better yet, basketball can be played indoors during the winter, the original intent of James Naismith when he hung up a peach basket in 1891 to invent the game. After observing the scrimmages at Birmingham hospital, a plastic surgeon by the name of Gerald Gray brought the sport to Norco, getting permission from the navy to allow wheelchairs on the hardwood floors of the newly built gymnasium. The learning curve was steep. “It was pretty hard going because I was so goddamn skinny that if I ever really pushed the chair hard, I’d flip over backwards,” Fesenmeyer says. “Guys would pick you up, and off you’d go again.” He solved the problem by stabilizing the front of his chair with lead weights. Wheelchair basketball wasn’t a panacea, but when the guys rolled onto the court, they could momentarily escape their anxieties. Damaged young men who had experienced the worst horrors imaginable found they could laugh and curse and taunt one another good-naturedly. For many, the simple game of hoops had become a life preserver. 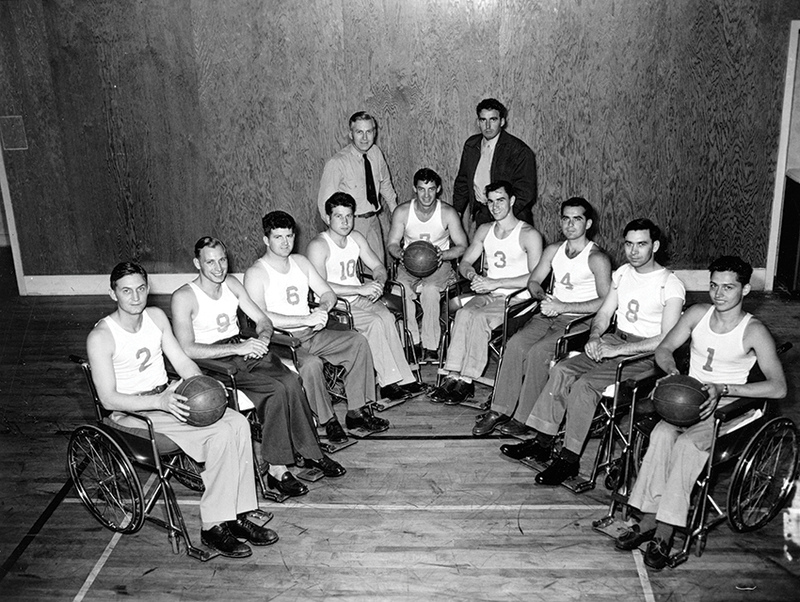 On March 18, 1947, the Birmingham Charioteers traveled to Norco to play the Corona Rolling Devils in the earliest recorded game between two organized wheelchair basket- ball teams. Corona had been practicing for only a few days, and it showed. Birmingham won easily, 20-6. The Devils regrouped around a gifted athlete named John Winterholler. Many people assumed that he would play Major League Baseball after graduating from the University of Wyoming; instead he joined the marines and was stationed as a lieutenant in the Philippines after Pearl Harbor was bombed. Winterholler and his men survived months of ferocious fighting on the island of Corregidor until they could hold out no longer. Winterholler was interned at three Japanese prisoner-of- war camps, where near starvation and lack of medical treatment caused his body to fail him. Blood vessels in his spinal canal ruptured, producing a hematoma that pressed against his spine, paralyzing him from the waist down. With Winterholler in command, the Devils crushed the Charioteers, 41-10, in a rematch. They reeled off 26 straight victories, several against able-bodied teams that played while in wheelchairs at well-attended exhibitions. The highlight for Fesenmeyer was flying to a game sponsored by the Oakland Tribune in May 1947. The Devils faced the semipro Oakland Bittners and Jim Pollard, a future Hall of Famer with the Minneapolis Lakers. “We sent them chairs about a week ahead of time so they could practice,” Fesenmeyer says. “I don’t suppose they did, thinking they could beat us.” Instead the Devils won, 38-16, in front of a sold-out crowd at the Oakland Civic Auditorium. 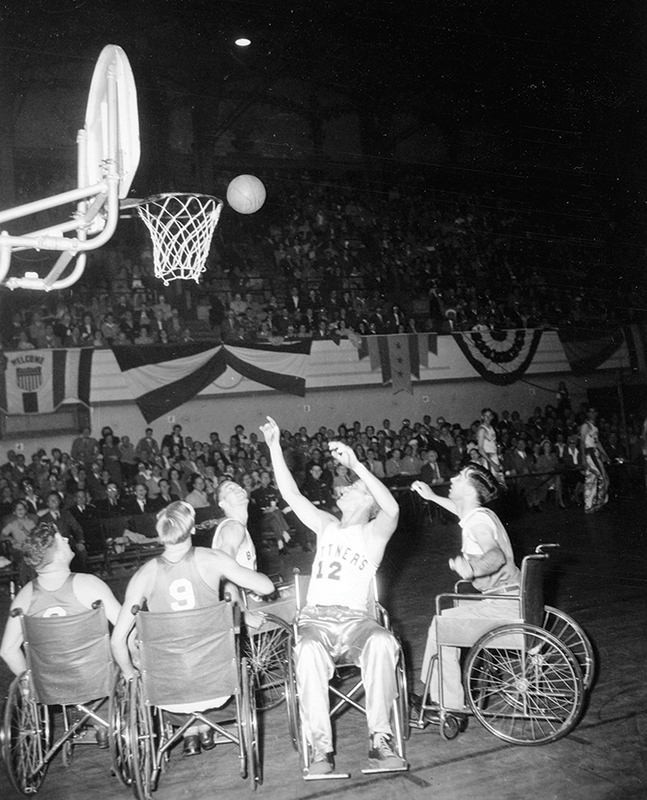 The success of the Devils and the Charioteers sparked a minor mania in wheelchair basketball. A game between two VA teams on the East Coast sold out Madison Square Garden in 1948, and Newsweek featured a wheelchair athlete on its cover. Almighty gossip writer Hedda Hopper used her column to raise funds for a cross-country barnstorming trip with Birmingham players. Veterans at the hospital also appeared in The Men, a 1949 film about injured vets that didn’t shy away from such issues as impotence and heavy boozing. The star was Marlon Brando, making his Hollywood debut as a paraplegic who had a deft touch with a basketball. As nonveteran paraplegics began to take to the court, Bob Rynearson helped form the National Wheelchair Basketball Association. Today it’s estimated that more than 100,000 wheelchair athletes play hoops, including youth and women, and it’s a headlining sport at the Paralympics. (The documentary Murderball captured the U.S. full-contact rugby team and the intense lead-up to the 2004 Games.) Since the genesis of the Paralympics in 1960, other adaptive-sports contests have emerged, among them the Special Olympics, for those with intellectual disabilities, and the Warrior Games, held for injured U.S. military personnel. The Rolling Devils broke up as members left the hospital, which closed in 1957. Despite decades of neglect, the once-magnificent structures of the Norconian Resort Supreme still stand. The town’s mayor, Kevin Bash, is trying to restore the Norconian, whose main building is on the National Register of Historic Places; Bash is seeking to add others as well. Like the patients it once housed, it needs some serious rehab. Fesenmeyer, who gave up the game, married and divorced three times while making a living in electronics in Southern California. After undergoing dozens of operations, he lives in a mobile home in a small town in southeast Texas, where a pair of aides care for him round the clock. “It’s a miracle I’m alive,” he says.